Sight to remember? 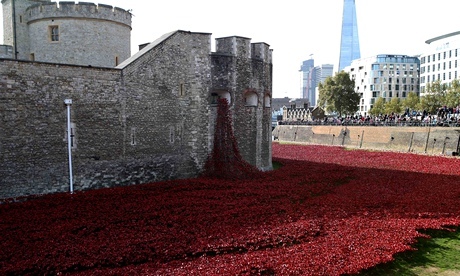 … the sculpture Blood Swept Lands and Seas of Red at the Tower of London. I accidentally got swept into a tide of humanity at the weekend, or to put it another way, couldn’t move for crowds. What was going on? Why were so many people choking the streets of the City of London, where shops are closed on Saturdays, looking for a bite to eat? It turned out to be overspill from a vast tumult at the Tower of London, where it is expected that four million people will visit by 11 November tosee its moat full of red ceramic poppies. This commemorative installation by Paul Cummins and Tom Piper has caught the national imagination. Having spent the autumn reviewing art exhibitions of various kinds, it was humbling to suddenly realise what people in Britain are actually looking at. It’s not Anselm Kiefer. It’s poppies. Crowds at the Tower of London have now grown at weekends to become a kind of artwork in themselves. The numbers and the variety of people from all over the country looking down into the Tower’s red moat on Saturday had more in common with a crowd gathered for a royal wedding than an art event. This is the real thing – popular art. 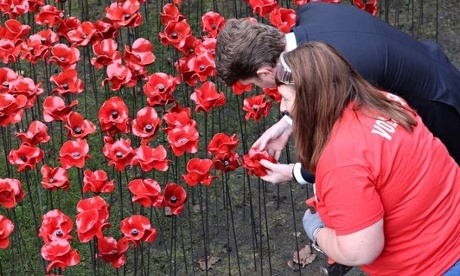 The US ambassador examines a poppy. But why was everyone here? The gentle jostling and sense of fun made it hard, when I visited, to see this as a profoundly moving work about the first world war. I have two objections. One is that by the time Blood Swept Lands and Seas of Red is completed – and it’s nearly there now – it will consist of 888,246 ceramic poppies, each representing a British fatality in the first world war. It is deeply disturbing that a hundred years on from 1914, we can only mark this terrible war as a national tragedy. Nationalism – the 19th-century invention of nations as an ideal, as romantic unions of blood and patriotism – caused the great war. What does it say about Britain in 2014 that we still narrowly remember our own dead and do not mourn the German or French or Russian victims? The crowds come to remember – but we should not be remembering only our own. It’s the inward-looking mood that lets Ukip thrive. But that’s probably an overinterpretation, because the spectacle of all these red poppies is emptier than that. In spite of the mention of blood in its title, this is a deeply aestheticised, prettified and toothless war memorial. It is all dignity and grace. There is a fake nobility to it, and this seems to be what the crowds have come for – to be raised up into a shared reverence for those heroes turned frozen flowers. What a lie. The first world war was not noble. War is not noble. A meaningful mass memorial to this horror would not be dignified or pretty. It would be gory, vile and terrible to see. The moat of the Tower should be filled with barbed wire and bones. That would mean something.